‧ The thin wall counter-bore of the NK enables it to be installed into single, variable or multiple thickness parent materials with the spin-spin tool without adjustment for parent material thickness. ‧ It can also be installed in single thickness parent materials with the spin pull tools for ultimate installation speed. ‧ The thin head allows the NK to be installed near flush with no special hole preparation. 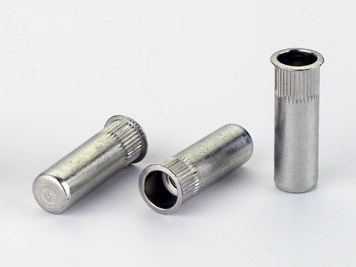 ‧ The knurled body provides increased spin out resistance. ‧ Available in open and closed end in steel, aluminum, brass and monel. 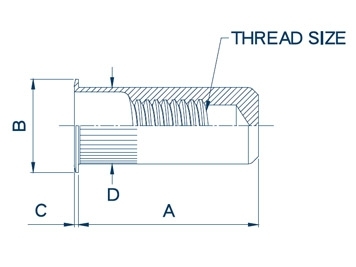 ‧ 6-32 to 3/8-16 and M4 to M10 thread sizes in various grip ranges. ‧ See page 20 and 21 for dimensional data and part numbers.